There is ample free parking available for short term parking near the venue. 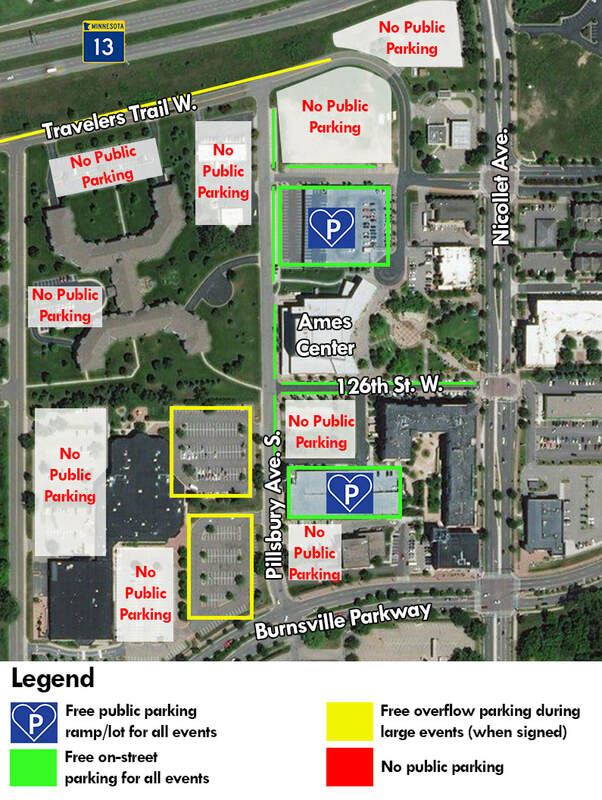 There are two large parking structures within one block of the Ames Center as well as ample on-street parking. Tour and school bus parking is allowed on the lower level of the Heart of The City parking deck. Chianti Grill is a locally owned and operated by Bob Gillen and Kevin Schleif and is part of the Superior Concepts, Inc. family of restaurants. Chianti Grill offers authentic and innovative Italian dishes along with grilled steaks, fresh seafood and an extensive wine selection in a comfortable, moderately upscale setting. JoJo's Rise & Wine, a coffee and wine bar located in Burnsville’s Heart of the City. Their café is on the lower level of the Park Crest condominiums, across from Nicollet Commons Park. Mediterranean Cruise Café located next to the Ames Center, great Mediterranean style food including fresh made hummus daily, wonderful gyros and baklava. Full Bar on site. Roasted Pear is a family owned, full service bar and restaurant in Burnsville, Minnesota. Often described as both elegant and casual, rustic and refined, the menu offers sophisticated salads, appetizers and brick-oven pizzas along with hearty pastas and meaty ribs and steaks. Located at 14200 Nicollet Ave, a mile and one half south of the Ames Center. Morgan's, Award Winning Restaurant featuring Local Farmers and located in the Best Western Premier Nicollet Inn. Open for Breakfast, Lunch, Dinner and Sunday Brunch. Other numerous food outlets within one block from the Ames Center include: Subway, Caribou Coffee, LS Pizza Shack, Mr. Chan’s Chinese food, Dickey's Barbeque Pit, Jensen's Cafe. For more information on your visit to Burnsville, visit the Burnsville Convention & Visitors Bureau website at www.burnsvillemn.com.